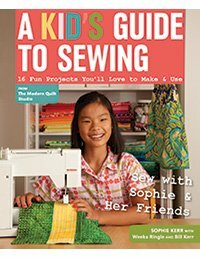 A Kid’s Guide to Sewing: 16 Fun Projects You’ll Love to Make & Use (C&T Publishing, $21.95, Ages 10 and up), by Sophie Kerr with Weeks Ringle and Bill Kerr, is reviewed by Mary Brown. A Kid’s Guide to Sewing: 16 Fun Projects You’ll Love to Make & Use by Sophie Kerr with Weeks Ringle and Bill Kerr, C&T Publishing/Fun Stitch Studio. The author of this terrific introduction to machine sewing for kids is a kid herself! The cheerful face of young Sophie Kerr graces the cover of the book, and at first she seems impossibly precocious to possess such skills and knowledge at such a tender age. But Sophie’s co-authors are her parents, Weeks Ringle and Bill Kerr, who are royalty in the world of modern quilting. This husband-and-wife quilting team have created some of the most memorable designs in the modern quilting movement, and are the co-founders of the Modern Quilt Studio. Little Sophie first learned to sew at age 3, sitting on her mother’s lap to run fabric through the machine. Sophie’s expertise and kid credentials combine to create a book that is both factually substantial, and age-appropriate. The first portion of the book introduces the reader to the sewing machine, as well as the fabrics and notions needed to execute the projects. The information and the accompanying photos are clearly laid out and easy to follow. A girl who had no experience in sewing could absolutely get started on her own, even if her mom forgot to take Home Ec and has no idea how to operate a sewing machine! The writer also hits the right note with the selection of projects included in the book. They are simple to construct, starting with the easiest undertaking – a pillow – and working up to the most challenging – a zippered tote. Along the way, the reader learns to sew functional items, garments and even a quilt. The finished products are cool enough for a kid to actually want to use, unlike many DIY craft books for kids, where the items are an adult’s goofy idea of what a kid might like. The author really earns her stripes in the straightforward, clear-cut approach to the instructions. No cutesy language, no steps under-illustrated; the reader gets a full explanation that invites personal creativity as well as skill-building. This book is squarely intended for machine sewing, while many kid craft books focus on hand-stitching, under the assumption, perhaps, that machine sewing is too complicated for kids. Sophie dispels that idea, and puts machine sewing within reach for her tween peers. This book is highly recommended for the self-starting girl who wants to learn to sew. Today Mary Brown reviews Girls Get Stitching! by Shirley McLauchlan & Fabric Paper Thread: 26 Projects to Stitch with Friends by Kristen Sutcliffe. The recent surge in DIY crafts can be seen in the number of bright, attractive books that are available to aspiring crafters who want to explore new, creative endeavors. Young people (okay, girls) are encouraged to learn the basics of sewing, embroidery and related crafts – that maybe skipped their moms’ generation. We’re looking at two of these books today, both of which seek to teach tween girls how to do basic embroidery and hand sewing. They each have their own charms. Fabric Paper Thread: 26 Projects to Stitch With Friends by Kristen Sutcliffe, C&T Publishing. BE CHIC & UNIQUE! 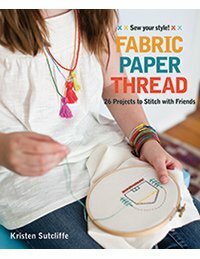 Fabric Paper Thread: 26 Projects to Stitch with Friends (C&T Publishing, $21.95, Ages 10-13) by Kristen Sutcliffe provides instruction for the basic skills needed to complete the fun projects that are featured. The emphasis is on hand-embroidery and hand-stitching, with some felting, leather, and glue gun action. No machine sewing is included. This book’s best attribute is its modern, spare aesthetic. It’s clear that Ms. Sutcliffe loves the look of the Anthropologie store chain; think of this book as the tween-craft harbinger of Anthropologie taste. The designs feature dainty graphics in a hipster palette. There is little variety amongst the images; if you go for the general look, you’ll like the book. If this isn’t your style, try a different C&T book. The introductory material does a good job of presenting the materials and skills that will be needed to create the projects. The basic five embroidery stitches are fully explained in both picture and text. However, not all aspects of the projects are fully taught, and the kid creator might well get confused. For instance, the ‘Easy Wrapped Bracelet’ tells you to use needle-nose pliers to crimp the clasping hardware, but there are no illustrations or even detailed instructions to help the crafter execute the task. Depending on the age of the crafter, this might present a challenging obstacle, especially as the items in question require real manual dexterity. Some of the projects lack appeal for the target age group. The ‘Arrows Wallhanging’ is a head-scratcher – neither the task nor the finished product are tempting, and good luck finding that driftwood. There is a slight disconnect in the book, between the age and experience required to make the crafts, and the appeal of the end results for a tween girl. Girls Get Stitching! 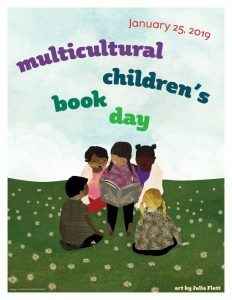 by Shirley McLauchlan, C&T Publishing. GO FROM DRAB TO FAB! Girls Get Stitching! 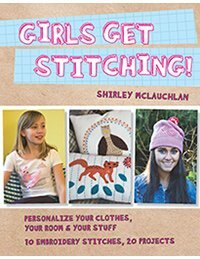 (C&T Publishing, $21.95, Ages 10 and up) by Shirley McLauchlan does a better job of wrangling the interests of the tween craftgirl. Like the previous book, this one fully describes the basic skills and materials needed to start out. However, the emphasis in this book is on cute embroidery designs to embellish items the crafter already owns. T-shirts are enhanced with a darling graphic of a fawn, utilizing both embroidery and simple applique. The design is modern and pleasing, and the tween can use a shirt she already owns. The same is true for many of the other projects in the book, like embellishing an existing pillow, hat or apron. There is also more variety amongst the graphics, along with encouragement to use one’s own imagination in creating the designs. http://youtu.be/nKM5EqCakRw While the aesthetic of Fabric Paper Thread is attractively hip, the actual instructional information of Girls Get Stitching! is more appropriate to the targeted reader. The projects are more doable, both in terms of difficulty and availability of materials. Fabric Paper Thread might be good for a self-starting tween girl who already has some crafting under her homemade belt. Girls Get Stitching! is a better choice for the tween just starting out in the crafting world. This book and a little packet of needles and embroidery floss would make an awesome springtime gift, as well as a worthwhile summer activity. We Love to Sew: 28 Pretty Things to Make by Annable Wrigley, from Fun Stitch Studio/C&T Publishing, 2013. 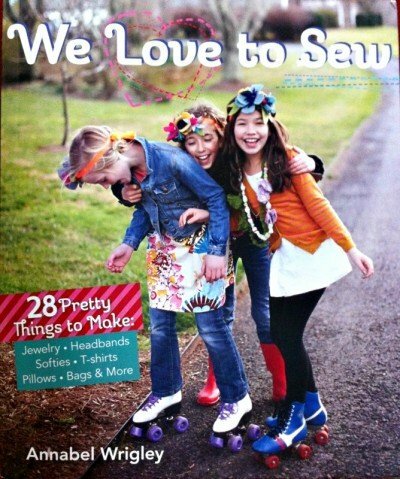 Mary Brown reviews We Love to Sew, 28 Pretty Things to Make: Jewelry, Headbands, Softies, T-shirts, Pillows, Bags & More. The craft of sewing is enjoying a renaissance these days, as young, modern women are taking up the needle to create quilts, garments and functional items with fresh fabrics and a new sensibility. * It’s as if sewing skipped a generation or two, and is coming back into vogue. 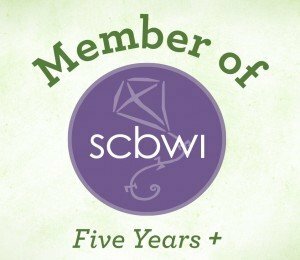 It’s fun and creative, and sewists can save money by making clothes and gifts more cheaply (and uniquely) than they can be bought. But how does a young girl get started sewing, particularly if her mom never picked it up? Annabel Wrigley has created We Love to Sew, 28 Pretty Things to Make: Jewelry, Headbands, Softies, T-shirts, Pillows, Bags & More (Fun Stitch Studio/C&T Publishing, $22.95) to help girls acquire sewing skills while making fun sewn items. Ms. Wrigley owns a studio in Virginia where she teaches girls to sew, and says that the book is a collection of the most loved projects they’ve made in class. The projects are appealing, and the book is executed in a cute, modern style. The photographs are gorgeous. The book is intended for girls age 8 to 14, although the projects’ tween appeal might make age 12 a more appropriate cut-off. The projects feature three skill levels, which the writer categorizes as ‘easy peasy’, ‘teeny bit challenging’ and ‘take your time, ask for help.’ So note that this voice, with phrases like ‘You will be the coolest girl in town with this adorable bag!’ may not appeal to every tween. The projects and instructions themselves are mostly hits. The little creatures, the pom-poms and the bags are fun and doable by small hands. The small quilt and mushroom house are perhaps overly ambitious so an experienced sewist would need to be lurking nearby to provide assistance for those. The instruction photos and drawings are pretty clear and easy to follow, although there were a couple of places where the pages felt a bit cluttered. The writer does a lovely job of encouraging girls to make the projects their own, not to strive for perfect replicas of the photos. A creative, self-starting girl can really go to town with this book, a few supplies and her own imagination. We Love to Sew, along with some fabric, needles and thread, would make a great holiday gift for a crafty girl. * Boys and men sew, too, but the book being reviewed here is obviously targeted to girls. A boy wishing to learn to sew might want to seek out a more gender-neutral book. 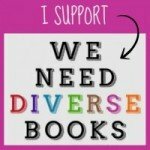 Here are links to reviews of other crafts books.